PEAK, a Kansas economic development incentive program, redirects employee income taxes back to the employing company. An economic development incentive program in Kansas is PEAK, or Promoting Employment Across Kansas. This program allows companies to retain 95 percent of the payroll withholding tax of employees. 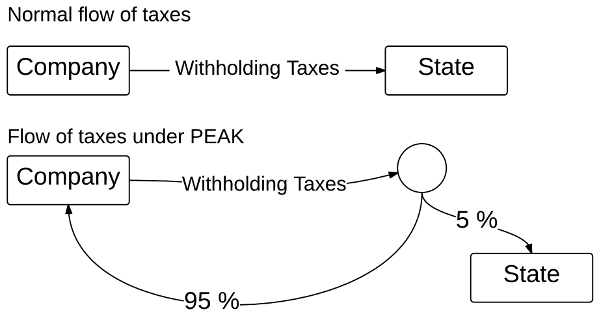 Flow of tax dollars under normal circumstances, and under PEAK. Legislators and public officials like programs like PEAK partly because they can promote these programs as self-financing. That is, the state isn’t subsidizing a company. Instead, the company is paying its own way with its own taxes (actually, its employees’ taxes). 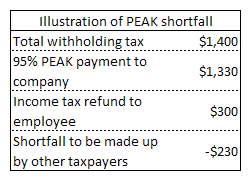 PEAK supporters say the state is not sending money to the company. Instead, the company is just holding on to 95 percent of its employees’ withholding taxes instead of sending the funds to the state. Schemes like PEAK call into question one of the fundamental principles of taxation: That tax funds be used to fund the operations of government, not to enrich one particular person or company. But continually, states and local government use programs like PEAK — and others like tax increment financing (TIF) districts, Community Improvement Districts (CIDs), Industrial Revenue Bonds, and others — that turn over a public function to private interests. Here’s another consideration regarding the PEAK program. The amount of money withheld from a worker’s paycheck is not the same as the amount of tax the worker actually owes the state. Withholding is only an approximation, and one that is biased in favor of the state. Many Kansas workers receive an income tax refund from the state. This is in recognition that the sum of the withholding taxes paid by a worker is larger than the actual tax liability. Therefore, the state is returning money that the state was not entitled to. Now, what about workers who are employed at a company that is in the PEAK program and who receive a state income tax refund? Their withholding taxes — 95 percent, anyway — have already been given back to their employer. So: What is the source of the money used to pay these refunds? How much money is paid in refunds to employees working at PEAK-participating companies? We should note that the funds don’t come from the PEAK company’s employees, as the employees receive credit for all their withholding taxes, even though 95 percent never contributed to the state treasury. Inquiry to the Department of Revenue revealed that there are no statistics on actual income tax liability of PEAK employees vs. the amount of withholding tax credited to that employee that was retained or refunded to the PEAK employer. The Department of Commerce referred inquiries to the Department of Revenue. If we wanted to know how much money was paid in refunds to PEAK-company employees, I believe we would need to examine the account of each affected employee. I’m sure it’s not possible to come up with an answer by making assumptions, because the circumstances of each taxpayer vary widely. Whatever the amount, it represents state tax revenue being used to fund an economic development incentive program that is pitched as being self-funded.